CONGRATULATIONS TO YOU, OUR WONDERFUL COMMUNITY! On behalf of the hard-working State Theatre for the Arts Board of Directors, it is my pleasure to announce that escrow was closed on the historic State Theatre on October 8, 2011. Escrow was opened on March 14, 2011, with an agreement for the State Theatre for the Arts (STFTA) to purchase the privately-owned State Theatre for the price of $441,000. I am most pleased to report that in seven short months the Tehama County community has stepped up to contribute the amazing amount of $230,000 to our Capital Campaign. Because of this overwhelming community support, STFTA has been able to secure a very attractive interest-only loan for the balance of the sale price. With continued support from all of you in this wonderful community, STFTA is very confident that the remaining loan obligation can be satisfied within the 24-month loan agreement time frame! STFTA would like to acknowledge the Ron Clark and Ben Sale families, past STFTA Board Members, and especially each and every member of this community who has so generously supported the efforts of our non-profit towards the acquisition of the theatre. We assure you that STFTA will do its very best to justify the support you have given us. We pledge to work to maximize the use of the State Theatre as a performing and cultural arts center for generations to come! Though we are thrilled with the progress made thus far, we realize that now that we have secured a loan to purchase this grand old theatre our work has truly just begun. We will continue our Capital Campaign for the purchase of the building. We also begin a new era as owner and operator of the theatre. In this role, we must strive to identify, expand and offer quality programming to all segments of the community. While we pledge to work to provide quality programming at the State Theatre, we understand that only with the support and participation of the entire community can we be truly successful! STFTA will continue to promote and provide quality performing arts programming. We feel the key to long term success may rest with our rental program. Any club, school, community organization or other entity may take advantage of this rental program to present appropriate programming to general or targeted audiences. Any person or group interested in utilizing the State Theatre is encouraged to request additional information by calling the State Theatre at 529-2787. 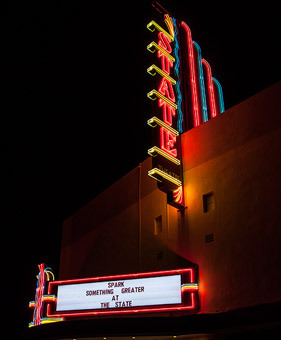 Additionally, State Theatre activity may be monitored by utilizing our web page at www.statetheatreredbluff.com as well as by following us on Facebook at The State Theatre Red Bluff. Thank you, Red Bluff and Tehama County! SEE YOU AT THE STATE!